(Nanowerk News) A clinical trial led by University of Leicester respiratory experts into a potentially ground-breaking ‘breath test’ to detect lung cancer is set to get underway at the Glenfield Hospital in Leicester. It is hoped that the LuCID (Lung Cancer Indicator Detection) programme will lead to a non-invasive method of diagnosing lung cancer in the early stages. The company behind the device, Cambridge-based Owlstone Nanotech Ltd, carried out a health economic analysis and determined that detection of early-stage lung cancer could be increased from the current 14.5% to 25% by 2020, it is estimated this could save 10,000 lives and £250m of NHS money. The device works by measuring volatile organic compounds (VOCs) at low concentrations in a patient’s breath and offers a cheaper and smaller alternative to existing detection technologies. Supported by the University of Leicester’s enterprise and business development team and Leicester’s Hospitals, Owlstone was awarded £1m by the NHS Small Business Research Initiative (SBRI) towards the second phase of the LuCID project – the clinical trials. The aim is to further evaluate Owlstone’s GC-FAIMS (Gas Chromatography – Field Asymmetric Ion Mobility Spectrometry) sensor in a rapid access lung cancer clinic at Glenfield Hospital, Leicester starting later this year. If successful, the project will pave the way to evaluate the technology in GPs’ surgeries and other hospitals. Billy Boyle, co-founder of Owlstone, said: “If you could change only one thing in the fight against cancer, it would be to detect the disease earlier where existing treatments are already proven to save lives. 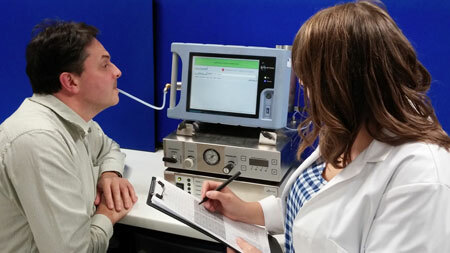 FAIMS technology has the potential to bring a quick and easy-to-use breath test to a GP’s office. Our team will not rest until we help stop the daily devastation that cancer brings to patients and their families." The clinical study is being led by Dr Salman Siddiqui, a clinical senior lecturer and adult chest physician at the University of Leicester and Glenfield Hospital with results of the trial expected in early 2016. The study will be delivered by a number of key members of the lung cancer clinical team including senior lung cancer clinician, Dr Jonathan Bennett. Dr Siddiqui added: “Lung cancer has one of the lowest 5-year survival rates of all cancers, however early diagnosis can greatly improve a patient’s prognosis. Current diagnostic procedures such as a chest X-ray, CT scan and bronchoscopy are costly and not without risks so the benefits of a non-invasive, cheaper alternative are clear.